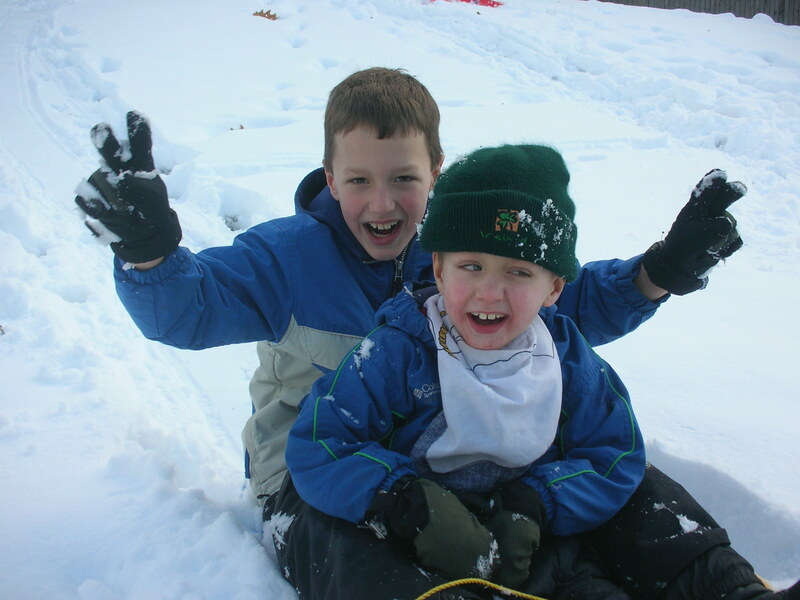 This is one of my favorite pictures of Aidan and Liam because it is so typical- two brothers having fun together. We’re so immersed in atypical things in our lives that I relish the moments that seem to belong only to other families. I also remember this sledding day being particularly triumphant as we pulled Aidan up the hill in the sled (yeah for Mommy’s biceps and Aidan’s core) and then let him sled down the hill alone (yeah for cold snow on the face tasting yummy). 1. We’re pretty dang funny. I believe it’s a survival technique. If we don’t laugh, we’ll cry, right? 2. We learn to focus on seemingly unusual things. We see things in a different light, and milestones may come so slowly that we have to celebrate each moment for what it is. 3. We stretch ourselves. Whether it be in doctors’ offices, school meetings, or the community, we’re passionate about making this world a welcoming place for our children. Hey, Heather. What a joyous photo! I know just what you mean about loving the “typical” moments. We have some similar shots from last winter of the kids in the snow.